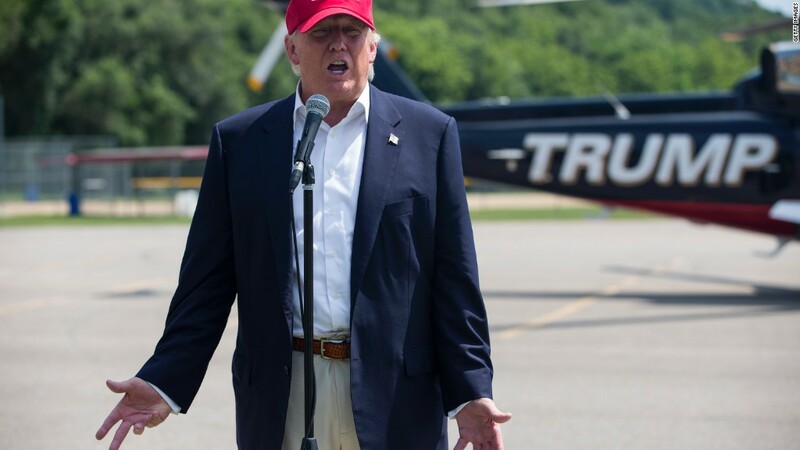 Donald Trump has won over much of the Republican electorate this summer. Among the conservative media establishment, however, opinions about the billionaire businessman are sharply divided. To some commentators on the right, Trump is making a mockery of conservatism and jeopardizing the GOP's chances of taking back the White House. To others, Trump represents the type of anti-establishment warrior lacking in American politics. 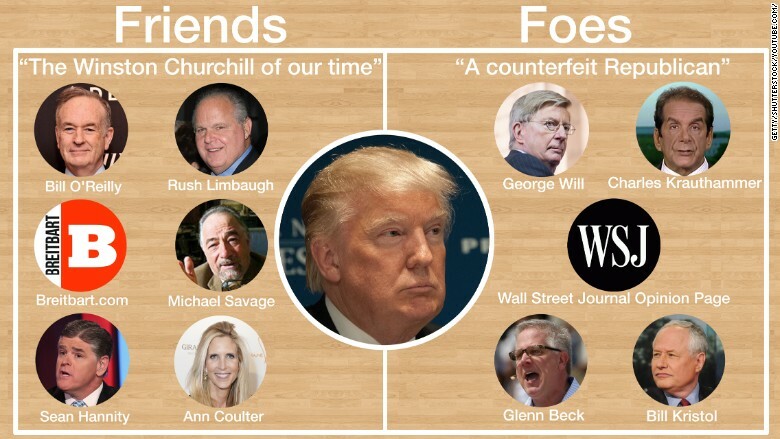 The following is a guide on where some of the most powerful players in conservative media come down on Trump. Ann Coulter: No prominent conservative has been a more effusive Trump supporter than Ann Coulter. The right-wing firebrand is especially fond of Trump's hardline immigration proposals -- so much so that she's even willing to forgive the real estate mogul for his support of Planned Parenthood. Sean Hannity: It was Fox News' host Sean Hannity who was a go-between in the recent dispute between Trump and Fox News chief Roger Ailes. Trump then sat down for a genial interview with Hannity, who later defended Trump against criticism from fellow conservative Glenn Beck. Hannity said in an open letter to Beck that he's "glad Donald Trump is in this race." "I like his straightforward outsider's view of politics," Hannity said. Bill O'Reilly: After Trump pledged to deport millions of undocumented immigrants, Bill O'Reilly took the Republican frontrunner to task on Tuesday night. But there is a clear mutual respect between the two, who took in a New York Yankees game together in 2012. O'Reilly said in June that he would "rather have the straight talk of Donald Trump than the obfuscation of Hillary Clinton any day, at any time." Rush Limbaugh: It is Rush Limbaugh's style to avoid criticism of any GOP presidential candidate, but there's no question the country's most popular radio host has been impressed with Trump. Last month, Limbaugh credited Trump for changing "the entire debate on immigration." On Monday, Trump tweeted that he was listening to Limbaugh's program. "Fantastic show, terrific guy!" Trump added. Michael Savage: Coulter's adoration of Trump has arguably only been rivaled by conservative radio host Michael Savage who has called Trump the "best choice we have." When he had Trump on as a guest last month, Savage gushed: "You're the Winston Churchill of our time." Breitbart.com: The conservative news website has long been friendly territory for Trump, who has provided the outlet with a steady supply of "exclusives" over the years. Trawl through Breitbart's archives, and you won't find too many negative headlines about Trump. You will, however, find stories like the one that was published last Saturday that said Trump "is on fire" and looked "presidential" at a news conference. George Will: There is no love lost between Trump and George Will. Trump has used Twitter to repeatedly hammer Will, and to question why Fox News allows the conservative columnist on the air. Will's feelings are mutual. In a column last week, Will dubbed Trump a "counterfeit Republican." Over the weekend, Will suggested that voters might have second thoughts about Trump once they consider the wisdom of giving the bombastic businessman access to nuclear weapons. But days later, Trump tweeted that Fox News should fire the "dopey" Krauthammer after he said that Trump's complaints about the first GOP debate didn't comport with the candidate's "tough guy" image. Glenn Beck: Trump's support from conservative pundits has confounded Glenn Beck. The former Fox News host took to Facebook to challenge Hannity, Coulter, Savage and Limbaugh over their admiration for Trump. "These are smart people," Beck wrote. "What am I missing?" Beck continued the discussion on Hannity's program this week. "I am really trying to understand how conservatives can look at Donald Trump's record, which he himself self-identifies more as a Democrat than as a conservative or a Republican, and say, That's our guy," Beck said. Bill Kristol: Trump lost Bill Kristol, the editor of the conservative Weekly Standard, with harsh comments about Sen. John McCain's service in the Vietnam War. "He's dead to me," Kristol said of Trump at the time. Kristol predicted the comments about McCain would hurt Trump. That didn't happen, but Kristol has continued to predict doom for Trump's campaign. Kristol offered an explanation for his shaky forecasts this week, saying he may have "overestimated" the ability of other GOP candidates to "preempt [Trump's] themes." My "Peak Trump" hypothesis supposed a modicum of enterprise by other candidates moving to preempt his themes. I may have overestimated them. Wall Street Journal editorial page: The editorial writers at the Wall Street Journal are no fans of Trump's campaign, stoking speculation that Rupert Murdoch, who owns the newspaper, is trying to shove Trump out of the race. Murdoch said last month that Trump was "embarrassing" the country. But the two businessmen spoke on the phone recently, and Murdoch has softened his tone on Trump. The WSJ editorial page, however, has not let up. On Monday, it ran an editorial asserting that an embrace of Trump's immigration proposal will make the GOP the "deportation party."